Don’t have anything to wear for that upcoming wedding yet? Don’t press the panic button just yet! The great folks at Amazon Fashion helped us put together 7 looks that WILL make heads turn at every wedding function. What’s more? These looks are a twist on ethnic wear and can be put together using your basic western wear essentials that might be lying around in your closet. Now you can bid good riddance to your #KyaPehnu dilemmas! 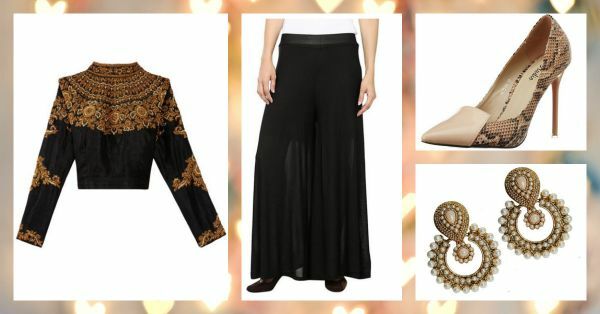 An embellished sari blouse goes well with a matched pair of palazzo pants. Jazz it up with chunky earrings and a hot pair of stilettos for the win at that upcoming shaadi! Use the same sari blouse with a matched (black) A-line skirt as an alternative look. Replace the stilettoes with a pair of embroidered jootis and you’re ready to be the desi girl at the wedding. A solid coloured kurta can be paired with your formal trousers if you accessorize right. Just ensure both the kurta and the trousers are a straight cut. 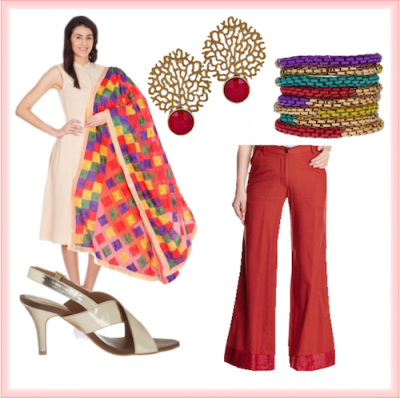 Add a pair of peep toes, a cuff bracelet, a statement necklace and ear cuffs and you’re all set for that sangeet. Basic kurtas also go well with a long pleated skirt - every girl owns one. A statement cuff, a bold necklace and beautiful earrings will lift the outfit and give you one helluva proud smile at a mehendi. Entering the wedding venue as a baraati and can’t dance enough to the sound of the dhols? This outfit is perfect for the twinkle toes in you. 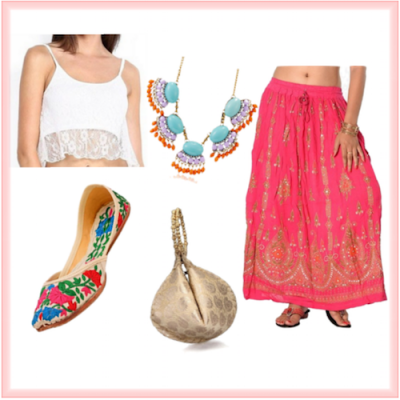 The jootis are comfortable enough to dance in all night long and the skirt and crop top make for a very trendy take on a lehenga choli. A potli bag always comes handy to carry all your essentials while you dance. Wear a matching pair of crop top with straight-legged pants (preferably a dull solid colour) and pair them with a bright embroidered dupatta and heels for the perfect reception outfit.